We have workshops for young people ages 4-7, 8-12, and 13-18. These workshops are open to all levels of experience. We believe that every young person is an artist. We offer Afterschool Workshops in the fall and spring and Summer Camps aimed to encourage and cultivate the artistry, imagination, and creativity of New Orleans’ young artists. We have workshops for young people ages 4-7, 8-12, and 13-18. These workshops are open to all levels of experience. All your artist needs is excitement and enthusiasm. In every workshop, we use theatre and performance to give young people a safe space to take risks, learn, be silly, play, collaborate, and create. Workshops are eight weeks long and meet twice a week. Thanks to our sponsors, Southern Rep is able to offer a limited number of need-based scholarships for all our Workshops and Summer Camps; please email education@southernrep.com for information. Registration for Game of Tiaras is currently closed. Please email education@southernrep.com to put your young performer on a waitlist. When the aging king of a Magical Kingdom (England) decides to split his empire between his three daughters, Cinderella, Belle, and the Snow Queen (who in no way resembles a copyrighted character), terrible tragedy ensues. Terrible, hilarious tragedy. Combining the gut-wrenching plot twists of Game of Thrones and the soul-numbing despair of Shakespearean tragedy, this adaptation of King Lear will leave you dying…with laughter! Families are responsible for providing a costume for their children. We also offer Before and After-Care for an additional fee. is currently closed. Please email education@southernrep.com to put your young performer on a waitlist. $450 Registration for The Little Mermaid is currently closed. Please email education@southernrep.com to put your young performer on a waitlist. For our youngest performers, we will be going under the sea! THE LITTLE MERMAID features music, multiple Little Mermaids, and all the characters you love: Sebastian the Crab, Flounder the Fish, and the French Chef! This show is perfect for non-readers and early readers and is a great option for performers of all experience levels! PLEASE EMAIL EDUCATION@SOUTHERNREP.COM TO PUT YOUR YOUNG PERFORMER ON A WAITLIST. THE ADDAMS FAMILY features an original story, and it’s every father’s nightmare. Wednesday Addams, the ultimate princess of darkness, has grown up and fallen in love with a sweet, smart young man from a respectable family – a man her parents have never met. And if that weren’t upsetting enough, Wednesday confides in her father and begs him not to tell her mother. Now, Gomez Addams must do something he’s never done before – keep a secret from his beloved wife, Morticia. Everything will change for the whole family on the fateful night they host a dinner for Wednesday’s ‘normal’ boyfriend and his parents. All roles open to all genders! For our youngest performers, we will be going to a magical castle where nothing is what it seems! BEAUTY AND THE BEAST features music, multiple Belles, and all the characters you love: The Beast, Lumiere, and Chip the Teacup! 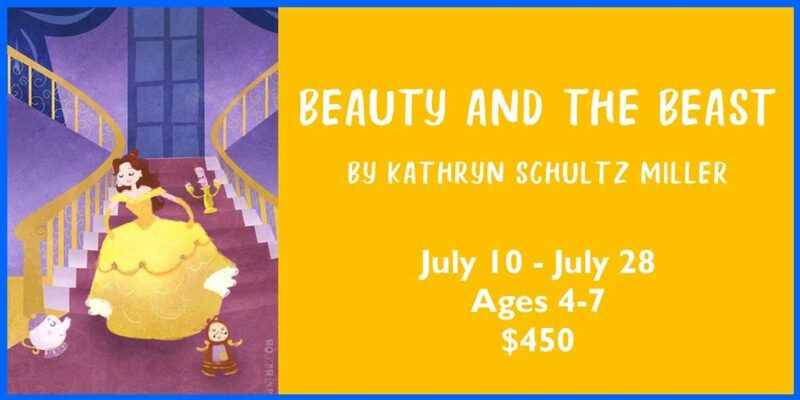 This show is perfect for non-readers and early readers and is a great option for performers of all experience levels! Your registration is not complete until Tuition Payment is received. You will receive a confirmation email when your registration is complete. If we do not meet our minimum registration requirement, we reserve the right to cancel the workshop. You will be notified in advance of the first day of class if this happens. Here’s a super easy way to navigate our entire site simply by clicking on a specific area.